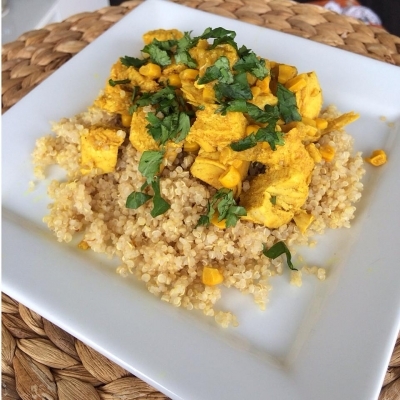 Ripped Recipes - Healthy Days Chicken Curry. Home » Recipes » Dinner » Healthy Days Chicken Curry. AA much healthier and leaner option of this famous dish. Enjoy guilt free. Chicken curry over quinoa. For curry I sautÃ©ed 1 onion with bell pepper, fresh squeezed garlic with 1 tbsp coconut oil. Then add 1/2 cup water, 2/3 cup coconut milk (or almond milk) and 1 tbsp white flour and whisk well. Add turmeric, curry, salt, cayenne pepper and a dash of cinnamon. Mix and add 2 chopped and cooked chicken breasts and 1/2 cup sweet corn. Mix and reduce to low and let it all cook together. It will be done when the liquid thickens. Top over brown rice or quinoa and sprinkle which fresh cilantro.